Even though I make cupcakes at home and rarely eat the ones I make, I still can't help but buy cupcakes if Tim and I stumble upon a cute cupcake shop. I love seeing the decor and how they frost and decorate. I also like to compare my cupcakes to what people are making on a larger scale and selling for $2-4 a pop. 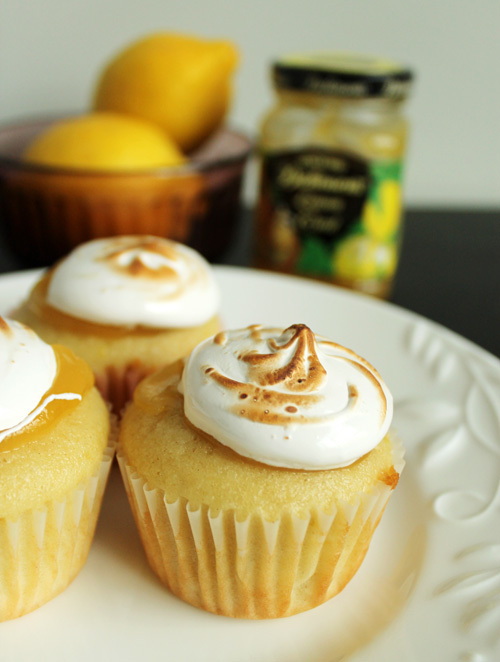 In most cases, I always get some kind of lemon cupcakes because I couldn't quite figure it out at home. With a little guidance from many many lemon cake recipes, here's what I came up with and are pretty darn tasty! Preheat oven to 300 degrees and line a cupcake pan with paper liners. Beat butter and sugar until light and fluffy. Add each egg one at a time. Once combined and fluffy, add lemon zest and juice, vanilla, salt, baking powder, and baking soda until combined. Add flour to the butter mixture, alternating between flour and milk. Only mix until combined so you don't overmix. Overmixing=dry cupcakes. Fill each cupcake liner maximum 3/4 full. You want them to stay light yellow, so be sure to not overfill as the batter will touch the sides of the pan and darken. Maybe you don't care about that, that's fine too. Bake for 15-20 minutes. After 15 minutes, keep a very close eye on them as you want them to almost be uncooked, but still set inside. You want them to stay pale on top. Let cool completely, then top with lemon curd. You'll remember this recipe from the S'mores Cupcakes from two weeks ago. Whisk egg whites, sugar, and cream and tartar in a double boiler over medium-high heat. Whisk frequently until mixture reaches 160 degrees (I used a candy thermometer). Transfer mixture into bowl of electric mixer fitted with a whisk attachment. Beginning at low speed, gradually increase speed to medium-high until stiff peaks form, about 5-7 minutes. Mix in vanilla. I piped my frosting on with a 1M Wilton tip and then used a creme brulee torch to toast the marshmallow topping. Please excuse that in these photos, I made the mistake of not whisking the meringue enough and the peaks weren't stiff enough. But hey, you win some, you loose some. They are still quite delicious! 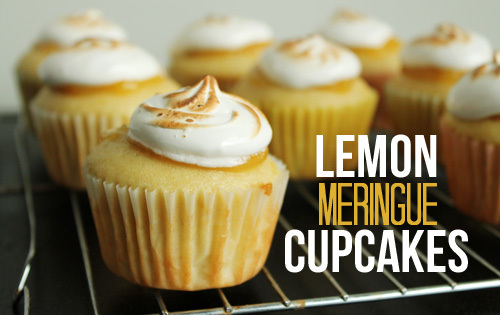 Adding the lemon curd is optional of course, but it definitely adds a little bite to the sweet cakes and sugary meringue. Tim actually said to me after eating one, "You know I'm a chocolate person and I think they're really good!" So that must mean something!